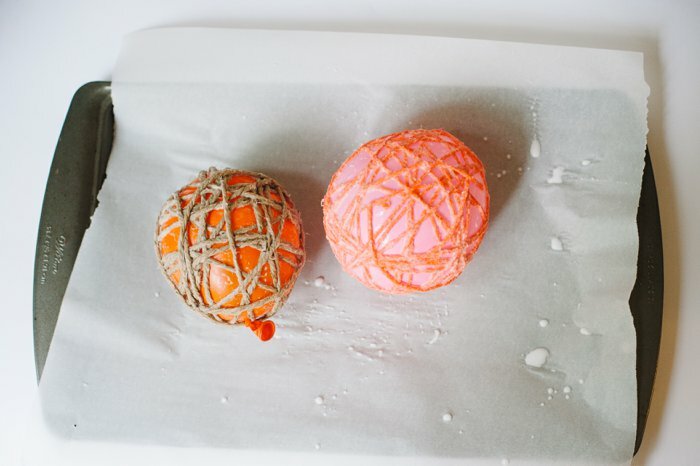 Yarn balls made with balloons are a fun, easy DIY craft. 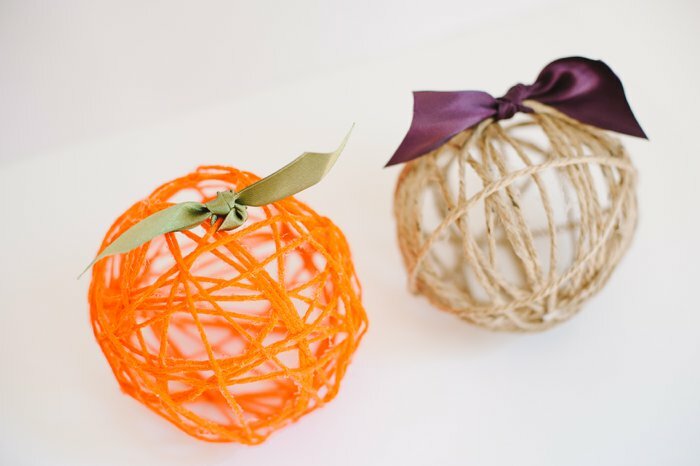 They can be made into yarn ball pumpkins, which are the perfect Halloween and Thanksgiving decoration for your home this fall! With fall arriving, it’s time to bring out the fall decorations! For me, that means the DIY spray painted pumpkins and gourds I made with dollar store finds. 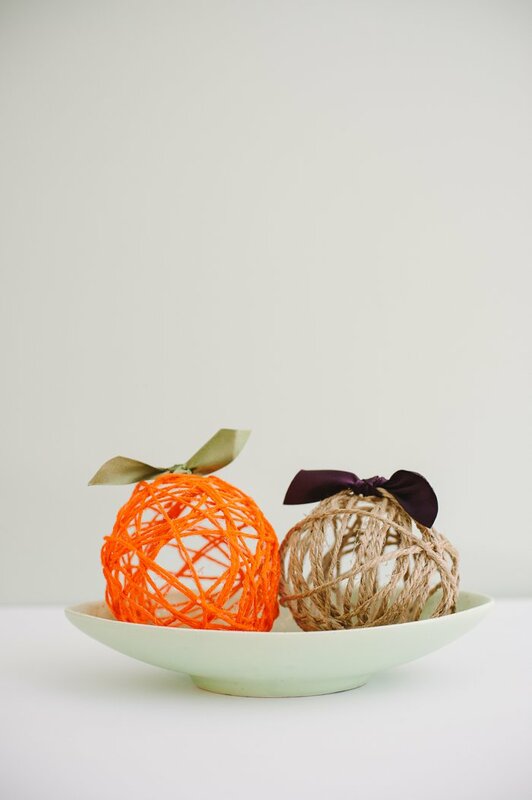 I wanted to add something new to my fall decor display, so I decided to try making yarn balls with balloons that I’d seen around online. 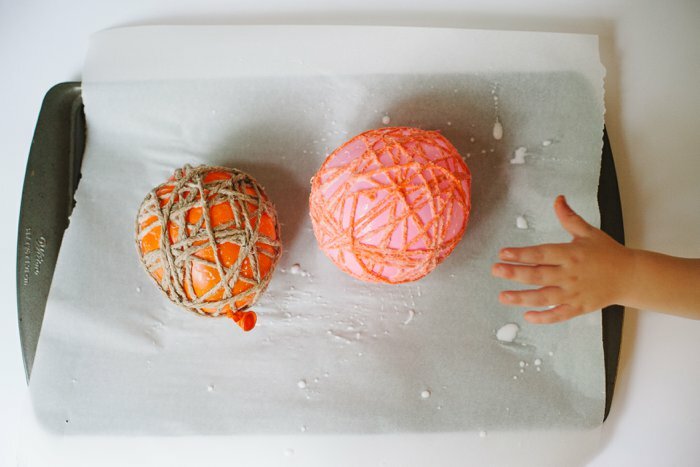 They ended up being surprisingly easy (and messy), and so cute! They are the perfect addition to my fall decor DIY lineup! 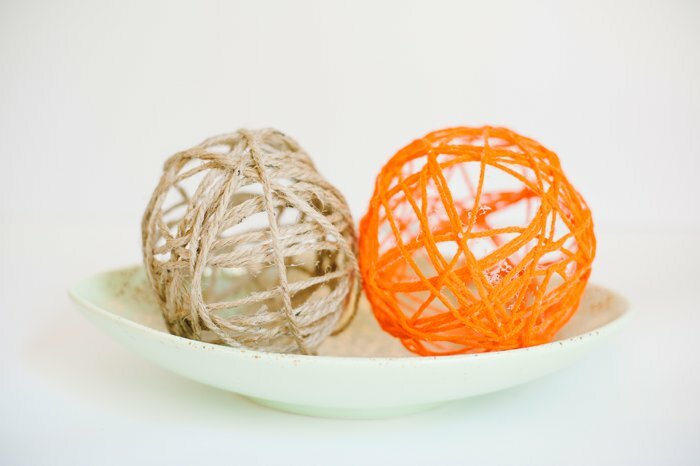 As the photos and tutorial will show, these yarn balls are made with a balloon and can be used in a variety of ways. I wanted to make fall decor, so I used autumn colors and turned them into pumpkins! Step 1: Blow up balloon and prepare the glue. 1a. 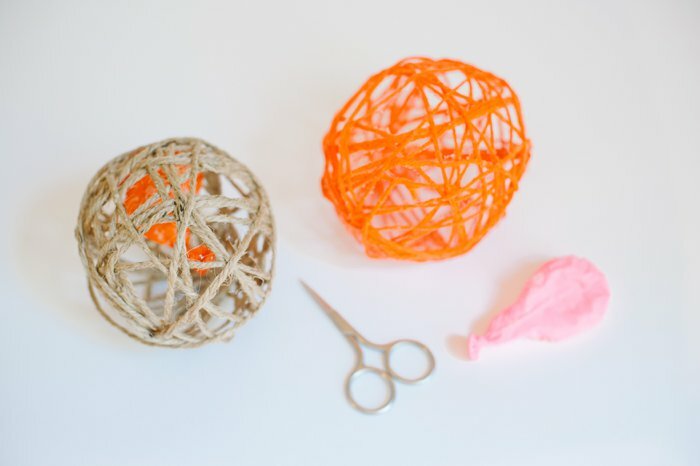 Blow up the balloon to whatever size you want your yarn ball to end up being. I blew mine up to be about 5 inches in diameter. 1b. 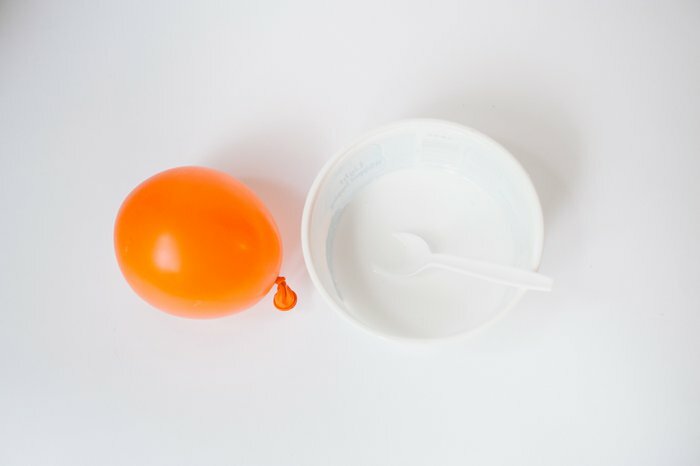 Mix glue with a little bit of water to make a runny mixture in a bowl. Step 2: Soak yarn or twine in glue mixture. 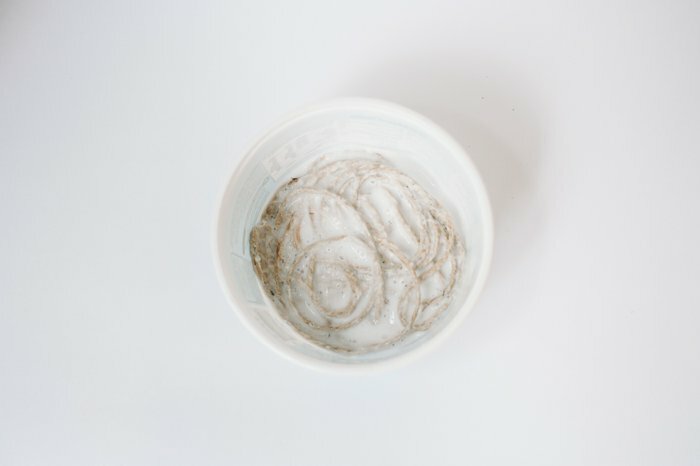 I cut a long piece of twine (several yards long) and laid it in the watered down glue mixture. Later, I read some people recommend cutting multiple 1 yard sections of string, and soaking those. This makes the yarn easier to handle and wrap around the balloon later. Next time, I will heed that advice, and cut multiple 1 yard pieces of string instead of one long piece. Step 3: Squeeze excess glue from string and wrap around the balloon. This is the messy part. I did it on top of a baking sheet lined with parchment paper, and it still got everywhere. That’s ok because the glue is washable, but be prepared. 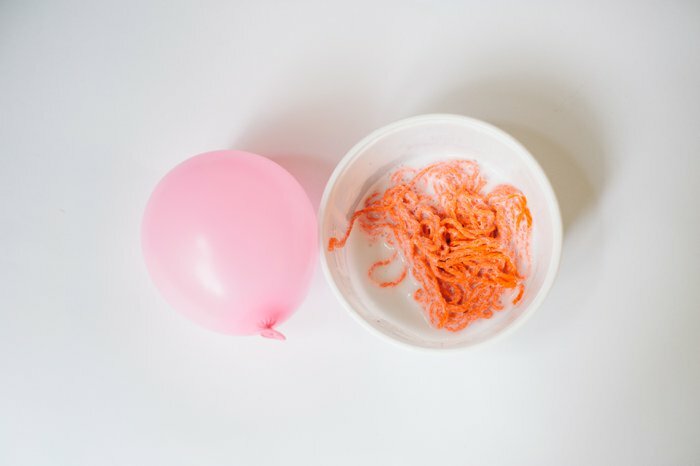 Take your balloon, and one end of the string from the bowl. Next, you want to squeeze some of the excess glue mixture off of the string so it’s not dripping wet. There’s no science to this; I ran the string through my fingers and squeezed some of the excess glue off this way before wrapping it around the balloon. You could also just squeeze the bundle of wet yarn and get the excess off this way. It doesn’t matter; you just don’t want drenched yarn. Then, start wrapping! You want to wrap all different directions. Again, no science to it; just go for it. This is another part that would have been easier if I had used multiple 1 yard sections of string instead of one long piece. That way, it’s easier to change the direction you’re wrapping and the end result would be a more evenly covered balloon. That’s ok though; I was still able to cover my balloons well enough. Once you’ve wrapped them enough (use more string if you feel like they’re a little sparse), tuck the end of the yard under another piece to anchor it. You can see how I did this on the pink balloon ball with orange yarn. A little bit to the left of the center, there’s the end of the yarn that I tucked under another piece to hold it in place. Step 4: Let them dry completely. Depending on how thick and how soaked your string is, as well as on the humidity in your house, the drying time may vary. Mine took two full days to dry completely. As they dry, the string will harden and get stiff. That’s what you want! After one day, I turned the balls over on my baking sheet so the bottoms would be exposed to air and could dry as well. Step 5: Once they’re completely dry, pop the balloon inside. I used a small scissors for this, but a knife would work too. 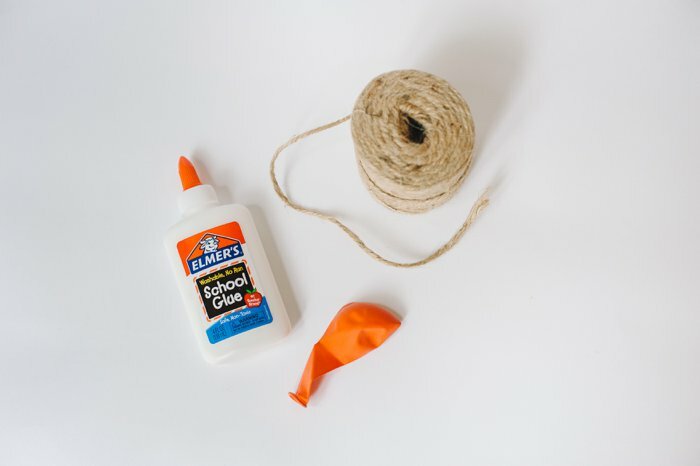 As the balloon starts to deflate, it might pull the yarn in with it and make your ball look shrunken and deformed because glue is sticking to the balloon a bit. I was worried I ruined the yarn balls when this happened. But once the balloon was fully deflated and removed, I was able to pop the ball back into its round shape easily. 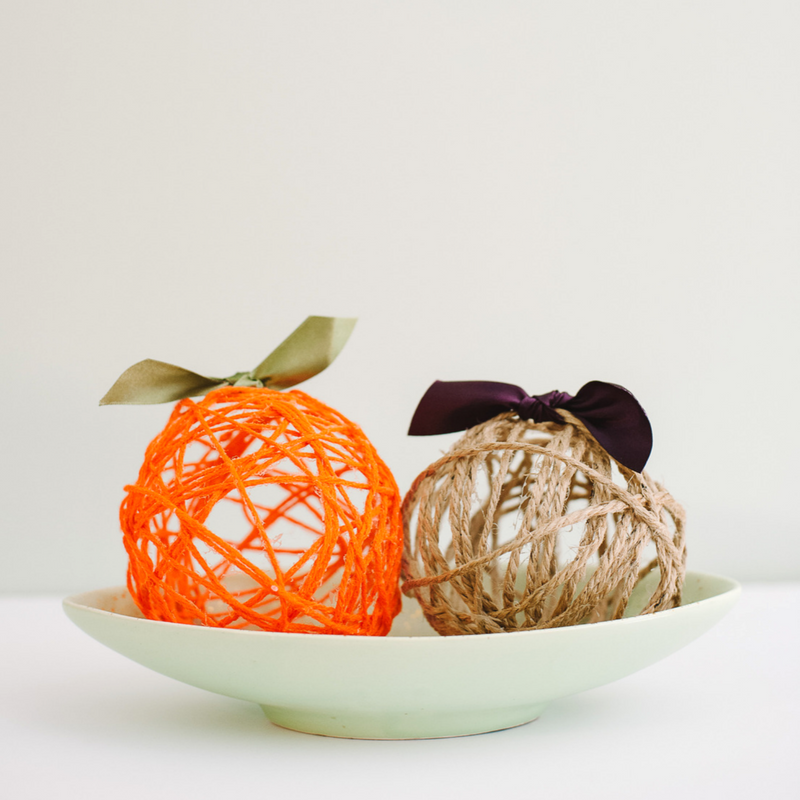 Keep in mind these balls are fragile; they are stiff from the glue but still pliable. Handle them with care! If you like the look of the yarn balls at this point, you’re done! 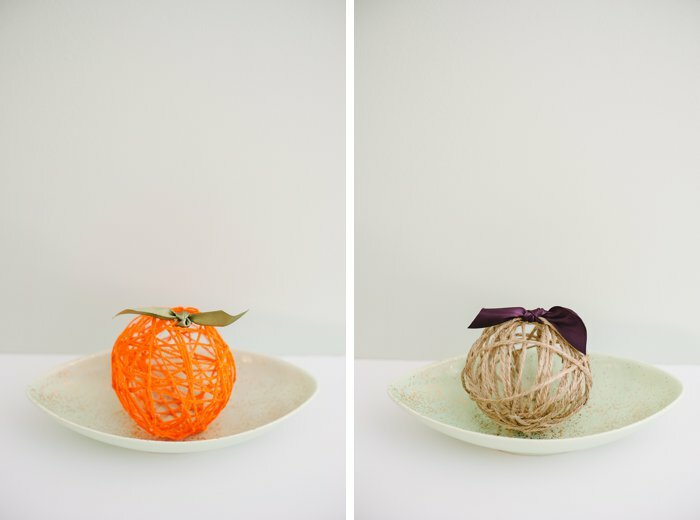 You can display them in a cute dish or bowl, or tie a thin ribbon onto one end as a way to hang them like a big ornament. Step 6: Add ribbon “stems” to complete the pumpkin look. 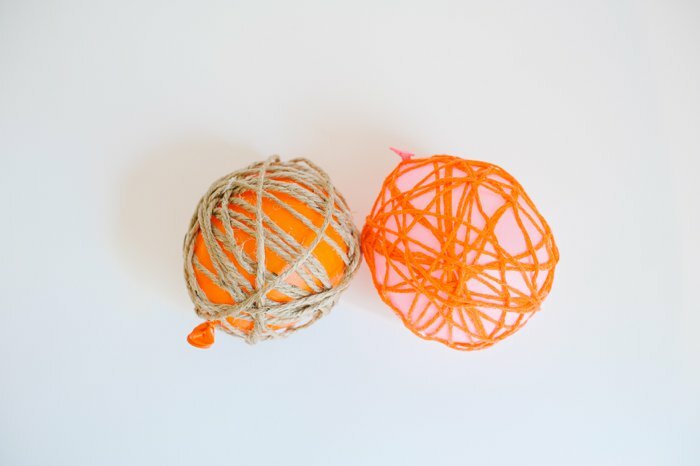 Using ribbon scraps, I added stems to the top of my yarn balls to make pumpkins. I knotted the ribbon around one of the stiff sections of string and trimmed the ends. Step 7: Display and enjoy! 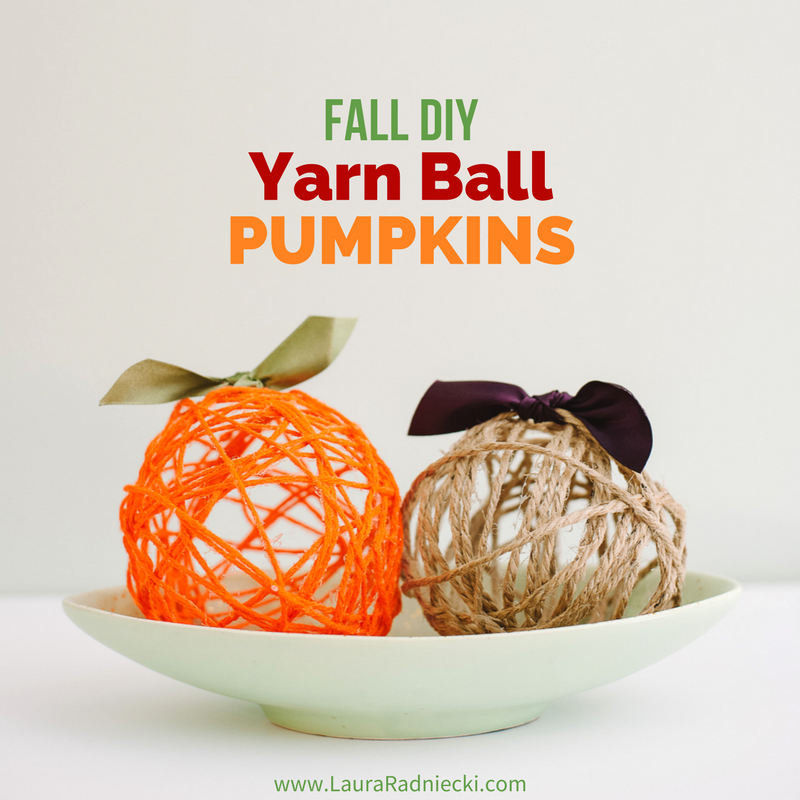 Yarn ball pumpkins! 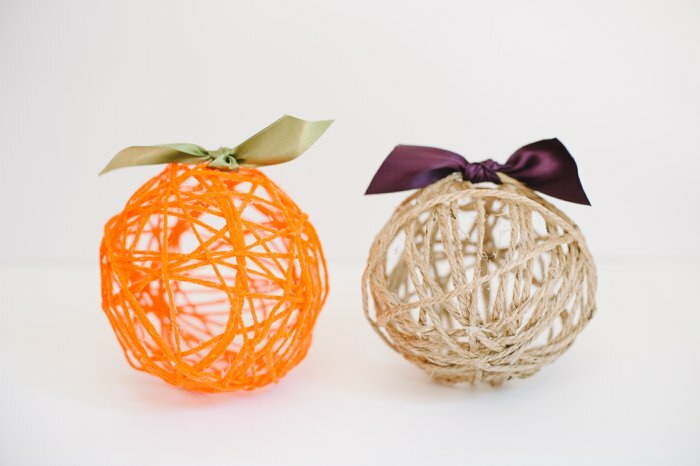 Actually, the one is a twine ball pumpkin if you want to get technical haha. You can decorate a bookshelf with them, add them to your mantel as part of a fall decoration display, or put them in a bowl in the center of your table for a cute fall centerpiece! 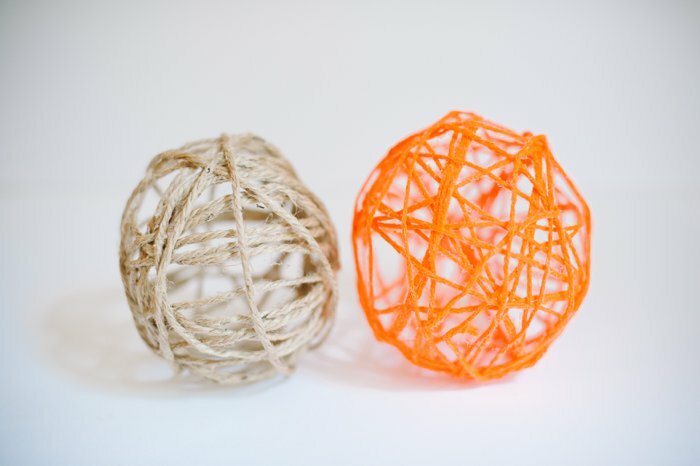 Yarn balls made with balloons and glue are an easy and cheap craft to make. They’re messy, yes. 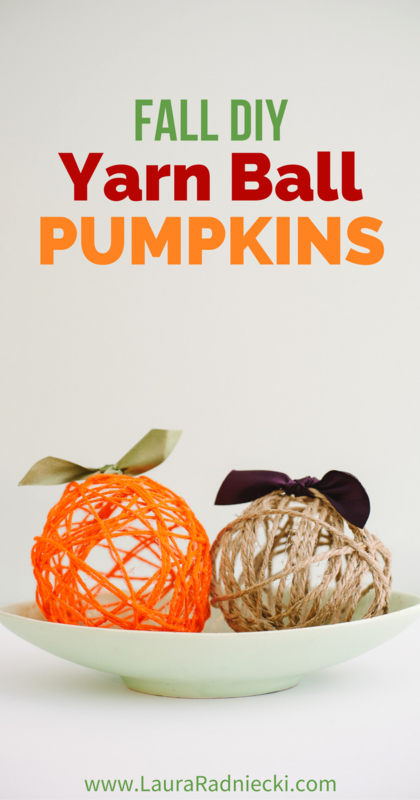 But they don’t require hardly any supplies to make and can easily be done with kids as a fun fall kids craft. They can be made with any kind of string, and in any color depending on the season or decor theme. They can be made into ornaments or a garland too. Just remember, they’re fragile so handle with care. But if they do get crushed by curious little hands, they’re so easy and affordable to make that you can whip up another set in no time!